When starting or managing a blog, there’s a lot to take into account. By far the first and most important is the idea itself. No point in having a blog without any content for it. With that out of the way, you have to look at some of the more technical aspects of running a site such as speed, information security, support (both for you and your visitors), storage, backup, etc. Only a small percentage of users have the knowledge to actually take care of all this manually. Most of us start off with an idea – the most important, but only dabbles in the rest of it, at best. Here is where a good hosting service can make your life a whole lot easier. Going the free route most of these features are closed off to you – basically, you get what you pay for. On the other hand, going the way of premium solutions you can rightly expect that most of the features we mention are run and maintained by them, leaving you with only your ideas and absolutely no additional hassle. We’ve singled out some of the key features you’ll want to keep an eye on and how choosing the right service can push your blog to the next level. Looking at the world today, nobody can deny that we’re in a constant state of hurry. With no option of slowing down, it’s not a surprise we demand no less from sites or blogs we visit. Seconds can mean minutes in a certain context and that relates to fewer visitors. This is why you want a hosting service like Kinsta that has a stable infrastructure and can keep up with any kind of traffic that’s thrown at it. 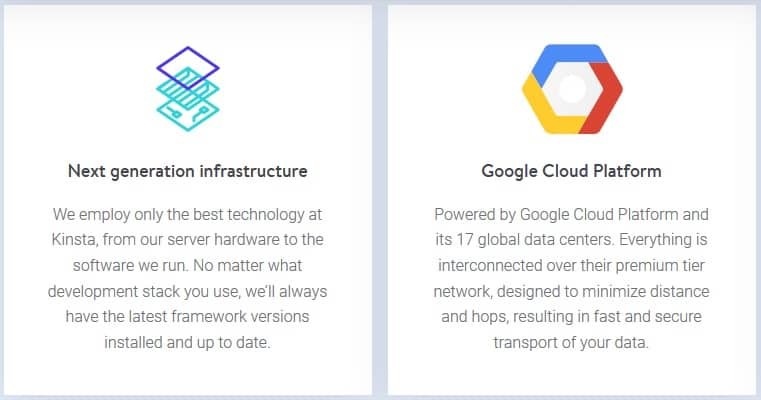 Kinsta uses a Google Cloud Platform premium tier network with 18 data centers located in the US, Europe, Asia-Pacific, and South America. The great thing is that you’re not randomly allocated to one of these – you’ll be able to choose which one suits you best. 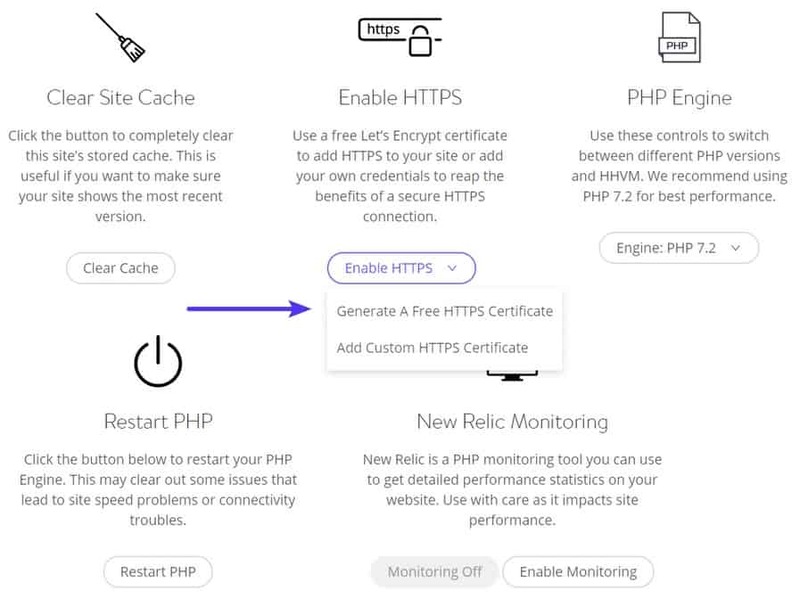 Furthermore, to ensure absolutely no dips in performance Kinsta implements the Amazon Route 53 premium DNS, KeyCDN and an optimized WordPress stack of PHP 7, Nginx, HTTP/2, and MariaDB – blazing speeds guaranteed. This is all fine and good for “regular” traffic, but how does it handle the pressure? Your blog’s just blown up in popularity because someone gave a shout out on national TV. You’re getting double or even triple your usual visitors. Then your worst nightmare comes true – the site crashes. Not only will you not make the most of the upsurge in popularity, but you’ll also risk negative feedback from an even bigger visitor base than normal. Do not fret, this worst case scenario will not come to pass with Kinsta because they employ an automatic scaling system that is capable of handling these kinds of spikes. Providing both yourself and your visitors with the proper security measures is one of the things that should be high on your priority list. Protecting sensitive information is essential for success and if that trust is broken it’s hard to get it back. This is why it’s advised to use multiple forms of protection in every aspect of your blog. 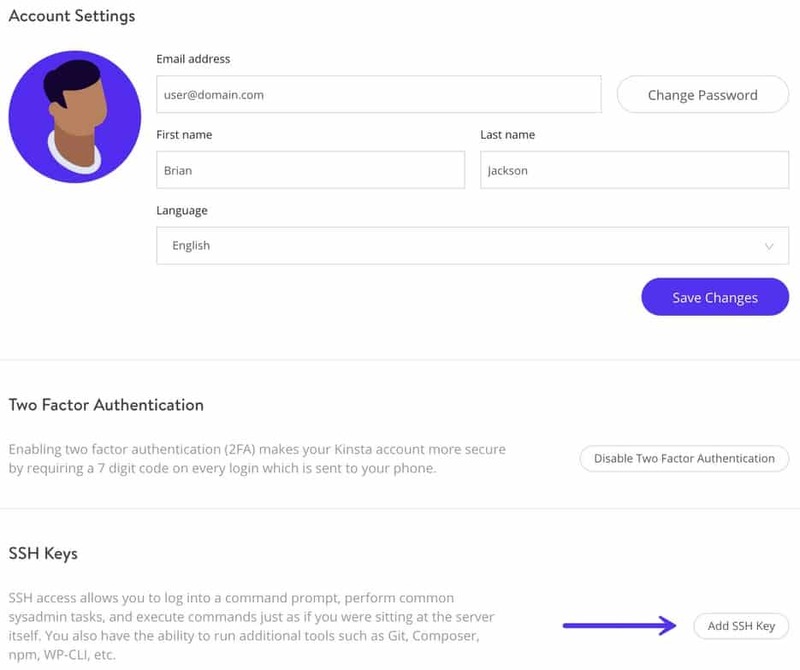 With Kinsta you’ll be getting a two-factor authentication method, automatic IP banning, and GeoIP blocking. The two-factor authentication works just like you would expect. Aside from the regular login with a password (required combination of upper and lower case letters, numbers and symbols) as the first factor, you’ll also have an option to enable the second form of authentication through SMS or the Authy app. Automatic IP banning is enforced after six failed logins in a minute, which in practically every case means it’s a bot or spammer. GeoIP, on the other hand, is an admin regulated feature where you can limit user logins depending on the location. All of this is mainly directed towards your protection from outside threats, but you’ll also want to show your visitors that your blog is safe for them. The Let’s Encrypt options help with that. With it, you can issue SSL certificates to enable HTTPS. Certificates aren’t the only protection, you’ll also have SFTP and SSH encryption that should keep everything safe and sound. Talking about support, it’s important to note that it’s oriented towards you, or more precisely your blog, not so much on your visitors. 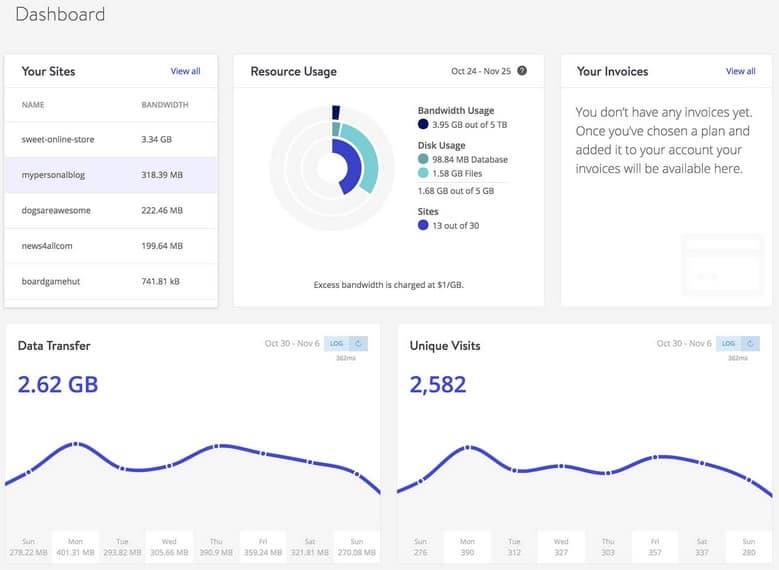 However, if you’re taken care of, it makes it so much easier to provide a better service to your users and with Kinsta you’re really taken care of. Their customer service is available to you 24/7 and apart from providing the assistance they also monitor your blog – uptime is checked every 2 minutes. The problem-solving rate is at a perfect 100%, and some of them are removed even before you report them. If something does go wrong to the extent that you have to roll back to a previous blog version you don’t have to worry because backups are done daily (and kept for two weeks), so reverting is quick and easy. In those instances, all needed repairs are done for free and you don’t suffer any downtime because of the regular backups. Speed, security and support are, aside from content, the key things to keep an eye for when running a blog, but there are certain additional features that will it easier to handle up the overall performance. Aptly named MyKinsta represents the dashboard you’ll be using while working on your blogs. From here you’ll be able to track the stats of all your blogs like bandwidth, disk usage, visitor numbers, and invoices. However, the dashboard isn’t just an information tool. You’ll be able to easily control options like migrations, DNS, billing etc. Anyone who’s ever attempted to migrate their blog knows that is a seemingly easy task that often just drags on and on. There are just so many little things you don’t consider, but they tend to complicate matters, that most of the time you regret the decision to migrate in the first place. It’s a good thing then that Kinsta has the solution. In every one of its tiers, you’ll have at least one free migration. You won’t have to do a thing and your blog will have no downtime while in the process – what could be better. If you’re by any chance still on the fence, we’ve got some more great news to push you over the edge. At the moment of writing, Kinsta decided to improve their standard features and surprised us with even better offers! These don’t include cheaper plans, but more features at the same prices. First of these is SSH availability in every price tier (previously available only on higher ones). This means you’ll be able to use Bedrock and Trellis, Git, Composer, and WP-CLI. Adding SSH keys is done via MyKinsta and, as everything else, couldn’t be simpler. Last, but certainly not least are migrations. We’ve already mentioned them and how much of a hassle they can be, but it’s great to know that all Starter plans paid annually have a free migration included in their plan. Combining the regular features with the promotional one really make Kinsta a hosting solution to keep a close eye on if you’re looking to get a blog on a premium hosting service. Running a “small time” blog with a limited amount of traffic is all fine and good – there’s a myriad of free hosting services that’ll get the job done. However, with more exposed content comes more traffic and that is the time where you’ll want to have a decent infrastructure to fall back on. All your visitors have other ways to spend their time while online, so you’ll want to keep them (and bring in new ones) not by just content alone, but the whole package. A fast, smooth running blog with no downtime that guarantees their information will be safe is something that shows you’re going the extra mile. If you’ve found that going with a premium hosting option really is the next step in your blogs growing cycle, then Kinsta is the way to go without a doubt.